It is no secret that Caroline thinks she is Taylor Swift. So, for Christmas Nan got Caroline a "stereo" with an attached microphone. It looks just like the one Taylor uses so she loves it! 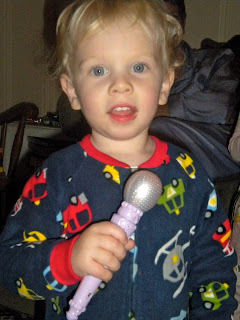 Tucker wanted to be a part of the action so he got the fake microphone and was happy as could be. Grandaddy made Caroline a CD of lots of her favorite songs including Taylor Swift and Sugarland. We have listed to this a thousand times! There is also once of Tucker's favorite songs on there..."Chicken Nugget Friday Night." Actually, it is "Chicken Fried" by The Zac Brown Band. The lyrics are something along the lines of " You know I like my chicken fried/Cold beer on a friday night..." Tucker heard the word chicken and immediately assumed they were talking about chicken nuggets.